Today’s guest blogger is Mathias Appel. 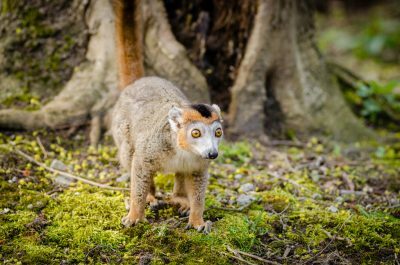 Mathias is a photographer in Dortmund, Germany who regularly contributes photography for conservation organizations like the Red Panda Network and the Lemur Conservation Network. His photography has appeared on Mongabay, Smithsonian.com, Buzzfeed, and more. View his Flickr stream here. All photos in this blog post are courtesy of Mathias Appel. 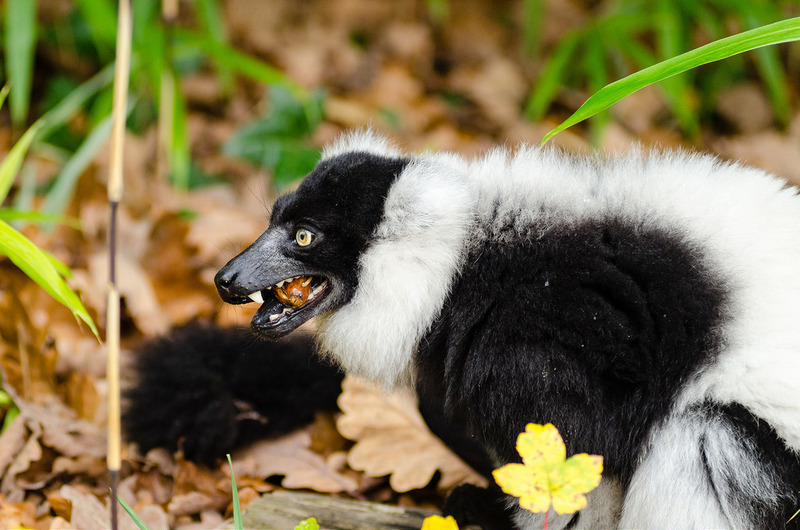 Here in Germany and other European zoos, you will often be able to get very close to lemurs. Open, walk-through exhibits allow you to watch different lemur species sitting in the sun together, foraging for food in the grass, or climbing around in the trees. In a walk-through enclosure like this, you may also suddenly find one of them sitting next to you! The Animal Park Olderdissen has a motto that explains this approach very well. Roughly translated it says: We protect what we love and we love what we understand. In other words, being able to get this close to them is an incredible experience and it lets you create a personal bond with them that actually makes you want to protect them. 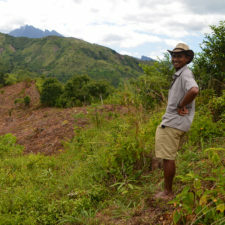 That’s how it happened with me and why I found the Lemur Conservation Network. Lemurs are great to visit at the zoo, but it’s not just about the entertainment. These enclosures are designed in very smart ways and always with the needs of the lemurs in mind. 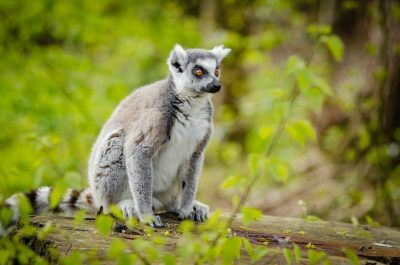 There are places where the visitors can watch them or get close to them but there are also places for the lemurs to retreat to. 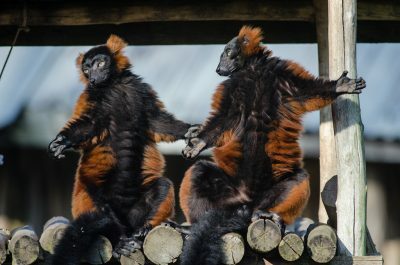 They are never obligated to entertain the visitors and zoo staff supervises them to make sure that visitors won’t harm the lemurs or feed them with junk food. The most common lemurs in these open enclosures are ring-tailed lemurs. 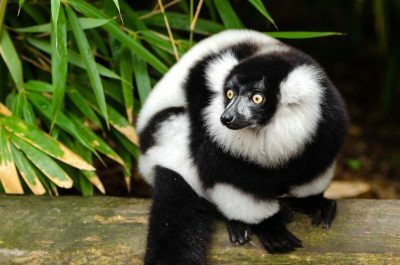 Often they share them with other lemur species like black and white ruffed lemurs, red ruffed lemurs, crowned lemurs or black lemurs. Enrichment is important and provided in a multitude of ways by zoos. Enrichment provides opportunities for climbing around and interactions with different lemur species inside the enclosure, with the goal of keeping them entertained, and enabling them to have as similar a life as possible to one in the wild. The zoos I personally visit which have enclosures like this are the Zoo Duisburg, the Zoom Erlebniswelt Gelsenkirchen (which means “Zoom Adventure World Gelsenkirchen”), the Allwetterzoo Münster (“All-Weather Zoo Münster”) and I also really enjoyed my stay at the Naturzoo Rheine (“Nature Zoo Rheine”). All of them are full members of the European Association of Zoos and Aquaria (EAZA), so you can be sure that they are doing a great job at keeping their animals safe and healthy. Most of the photos in this blog entry I took at Zoo Duisburg. Their enclosure is built like an island with a path to walk through. The lemurs won’t cross the water or go through the exits. They have lots of ropes and trees to climb on, they have shelters to sleep in, and the whole area offers them a lot of space. It is an amazing experience to look up and see them sit in a tree together, happily looking for food or stretching out their arms while they are sunbathing. 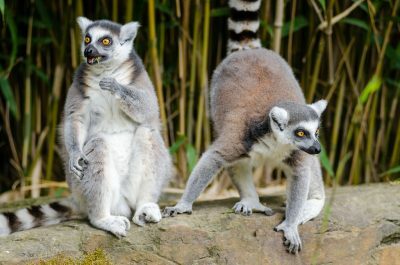 In the enclosure at Zoo Duisburg, they currently have a group of ring-tailed lemurs and black and white ruffed lemurs. The lemurs are friendly and very curious. The staff is passionate and is doing a fantastic job of caring for them. 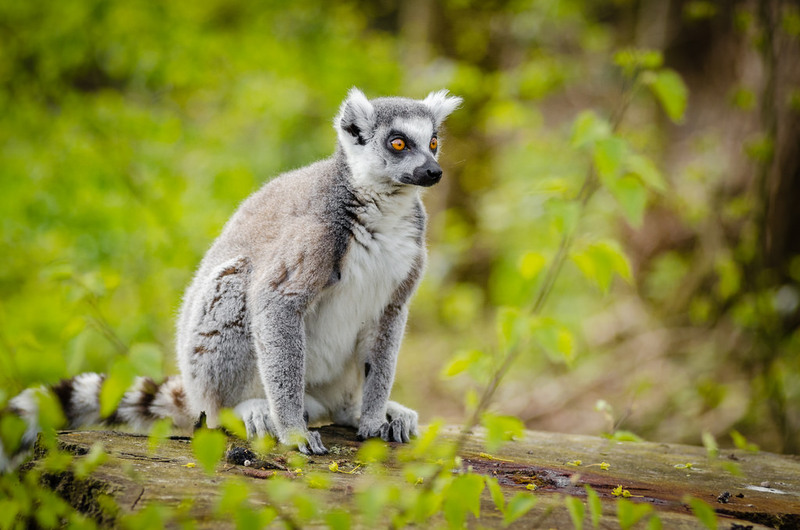 To make sure that the visitors behave, they work with volunteers who make sure that the visitors abide by the rules: No food, no smoking, don’t bother the lemurs. This 20 years old female black and white ruffed lemur called Andora often comes running towards me when she sees me in the morning. She takes a look at my camera, sniffs around a little and then she usually sits all the way up in a tree and watches the first visitors to arrive in their enclosure. At the Zoom Erlebniswelt Gelsenkirchen they designed their enclosure a little differently. This zoo’s exhibit is also built like an island but there is no path through it. 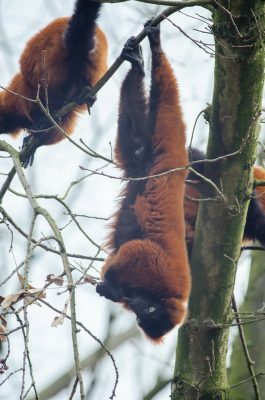 Instead it has a big and round zone for the visitors from which you can watch their red ruffed lemurs, the only lemur species they have at this zoo. The great thing about this enclosure is that you can see the lemurs very well. You can see them feeding high up in their tree, how they sunbathe in the morning, or as they sleep in front of their shelter, away from the visitors. Often they get very close to the visitors. 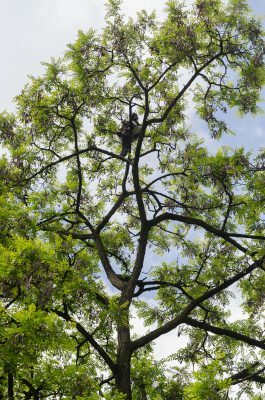 On Sundays the zoo keepers will tell you more about them while they are being fed and often you can hear them call down from the trees which is just breathtaking. The Allwetterzoo Münster also has a lemur island. The design of the area is similar to Duisburg but the area visitors can walk through is smaller. 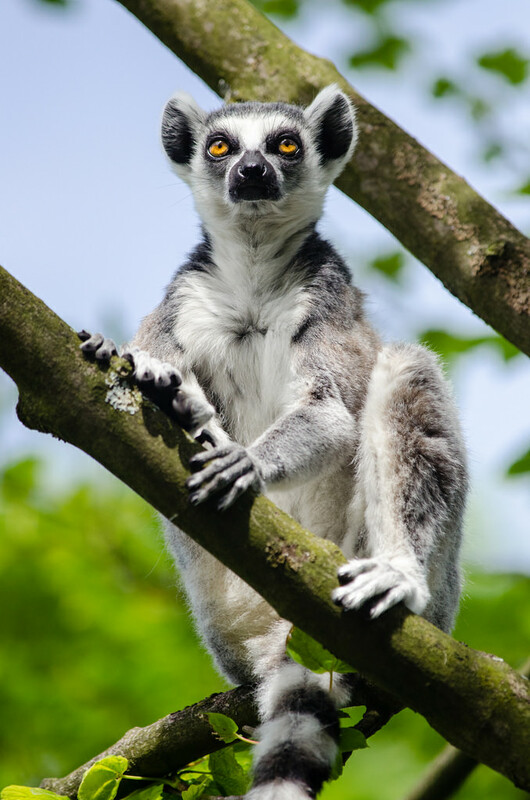 Their ring-tailed lemurs have more trees to climb around in but they are not as high. Zoo staff always keeps an eye on them and makes sure the visitors behave themselves. 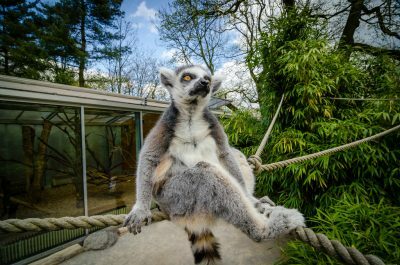 Just like in the other zoos their lemurs also have places to retreat to and an indoor area. 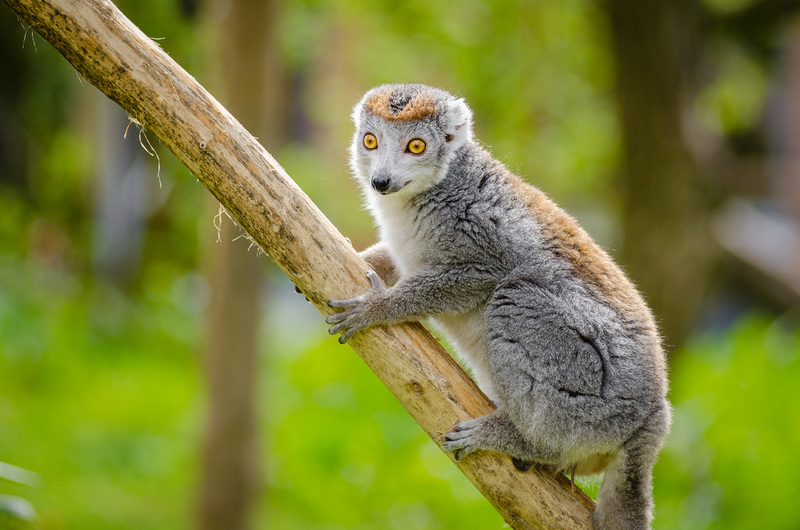 Naturzoo Rheine recently opened an all new open lemur enclosure called the Lemur Forest. I visited them on the day they opened the enclosure and it really impressed me. Instead of being designed as an island, there is a fence around it. The area for the lemurs is huge though, much bigger than it is in the other zoos that I visited so far. 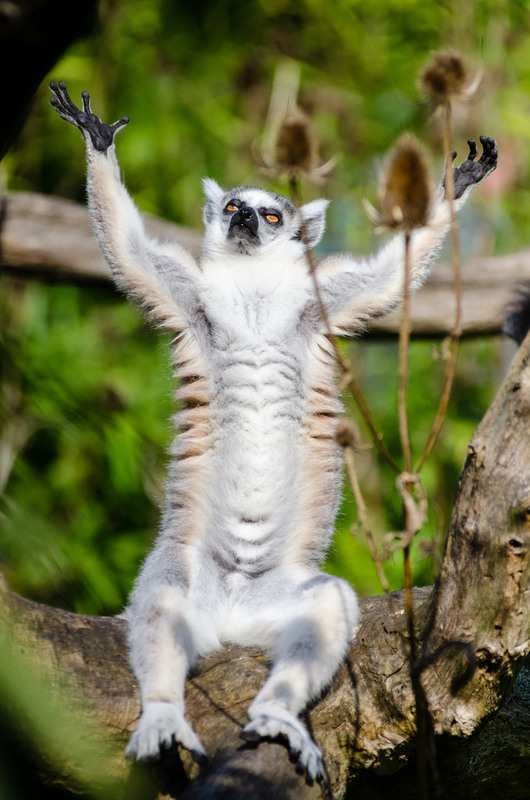 But there is a reason for that, as they plan to have a large variety of free ranging lemur species. When I visited them they had ring-tailed lemurs and crowned lemurs. 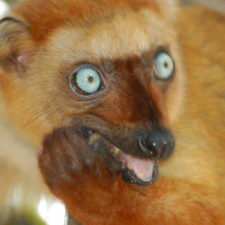 But soon they will also have free ranging black lemurs, mongoose lemurs and red fronted lemurs. The biggest variety of lemurs I will have seen in an enclosure of this kind. You enter the enclosure through the entry and arrive in the visitor area. From here you can watch the lemurs. Naturally they are free to come closer to you as the volunteers make sure that no primates, Strepsirrhini or Haplorhini kind, get hurt. You can’t understand a creature just by reading about it in a book or on the internet. Pictures let you see the animal but they won’t let you look them directly in the eyes and you can’t see how soft their fur is. It is hard to learn to love them just through pictures or videos. The lemurs I have met like this have taught me a lot. They showed me how beautiful and friendly they are. I learned to love them and now I wish to protect them so future generations can also see how amazing and diverse they are. And for that I am grateful that amazing zoos like these exist that take proper care of their animals and that care about conservation efforts. 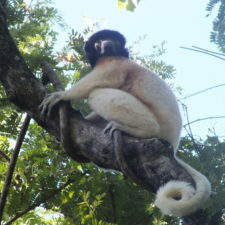 Mathias recommends the following ways to support lemur conservation. Browse the Lemur Conservation Network website to learn more about lemurs, and find an organization to support. 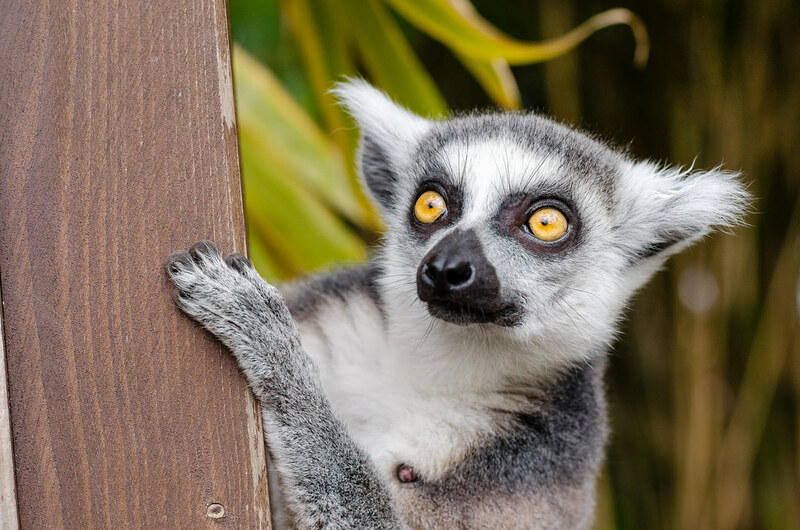 Follow Lemur Love, the Lemur Conservation Foundation and Aye-Aye Conservation on social media, and donate to support them when you can. 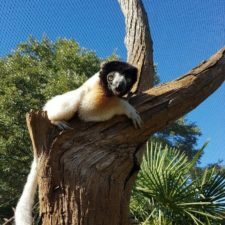 If you have zoos nearby that house lemurs, consider volunteering there, especially if you know a lot about lemurs and conservation. Being able to watch lemurs as a volunteer is great, but it is also an opportunity to educate people about them in a fun and engaging way.